After refereeing volleyball at the provincial and national levels for more than a decade, Capt Steven Stuart took his officiating career to new heights in 2017. 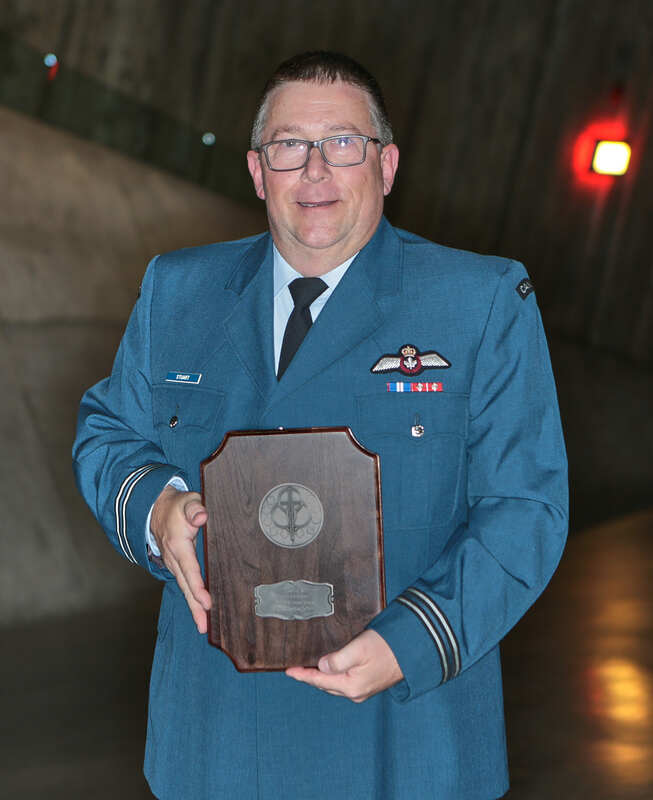 Capt Steven Stuart with his CAF Sports Award for Official of the Year, which was presented at the annual ceremony at the Canadian War Museum in Ottawa on October 18. The year saw him serve as an official at the CAF National Championships, the Canadian Volleyball Championships, and at the 2017 Canada Games in Winnipeg, along with his very first international appointment at the CISM World Military Women’s Volleyball Championship in Jacksonville, Florida. He also officiated a number of tournaments and meets at the provincial or regional level through 2017, along with serving as the CAF Chief Official for Volleyball. He’s since been recognized by the CAF for his accomplishments during this banner year, being selected first as the MARLANT Official of the year, then as the RCN Official of the Year. And at the CAF National Sports Awards Ceremony, held October 18 in Ottawa, he took the year’s top honour, being named CAF Official of the Year for 2017. It’s actually the second time that Capt Stuart, who works as a surveillance officer inside the Regional Joint Operations Centre (Atlantic), has won the trio of CAF officiating prizes. He was named CAF Official of the year in 2007 as a multi-sport referee, when he was focusing on hockey, with his volleyball career just getting started. “It was a surprise to get the award again 10 years later, and I’m very appreciative,” said Capt Stuart, who has since given up hockey to focus more of his time on volleyball officiating. Watching the gold-medal winning Chinese team, which included some of the country’s top players from the China’s national team, was especially exciting, he added. Capt Stuart was never a high-level volleyball player himself, with hockey being his sport of choice, but when his son took up the game at the high school level in 2005, he decided to get his officiating certification, also took up coaching, and generally became more involved with the game. He said he’s gained more appreciation for the sport as he progressed up the skill levels, and doesn’t plan to slow down anytime soon. He was back refereeing international military action at the 2018 CISM Championships for men and women in Edmonton, and is currently planning a trip to Florida in February to serve as court manager at an elite-level beach volleyball event featuring some of the world’s best, including former Olympians. Officiating locally at the university level is also a common activity for Capt Stuart, and he recently finished a five-year stint as Nova Scotia’s volleyball Referee in Chief. “I do it for the love of the sport,” Capt Stuart said.